Alliance Sensors Group’s new LV-45 LVIT linear position sensors can withstand high vibration, severe shocks, and temperature and humidity fluctuations. Designed for measurement applications requiring rugged devices, the contactless inductive sensors are suitable for heavy industrial and extreme environment civil engineering applications. They are able to replace DC-LVDTs and offer mounted flange, rod eye end, connector or cable termination, and captive connected rod assembly options. The sensors also allow a user to adjust their zero and fullspan output to the range of motion of the item being measured after a sensor’s installation. Moorestown, New Jersey, December 4, 2018…H. G. Schaevitz LLC, Alliance Sensors Group has released its LV-45 series inductive, contactless linear position sensor using LVIT Technology. The LV-45 linear position sensors are specifically designed for measuring applications requiring rugged devices, whether measuring position of steam turbine valves, mounted in a paper mill head box or calendar roll stand, or outdoors fastened to a building, bridge or structure. 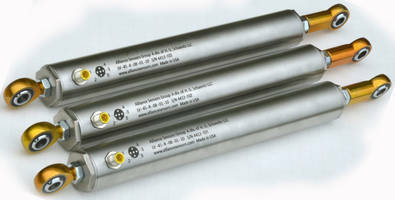 The LV-45 series was designed after identifying the wants and needs of engineers in the industrial world, so LV-45 Series linear position sensors can withstand the high vibration and severe shock environment found in steel, aluminum, and paper mills, as well as extremes of temperature and humidity found in most outdoor applications where many other types of linear position sensors cannot survive. The LV-45 series uses a proprietary inductive technology that allows it to replace traditional DC-LVDTs in most applications. Its simple coil design permits the sensor to be both shorter and more rugged than its DC-LVDT counterpart while operating over a wider temperature range. The LV-45 series is available with optional mounting flanges, rod eye ends, connector or cable terminations, and a captive connecting rod assembly that cannot break loose. The SenSet™ range adjustability feature allows the user to scale the sensor's zero and full span output to the actual range of motion of the workpiece being measured after the sensor is installed. The LR-19 and LR-27 series are LV-45 sister products for less extreme environments. For more information on Alliance Sensor Group, contact sales@alliancesensors.com or go to our web site at http://www.alliancesensors.com/.